My husband and I are in love and also in love with Night In Boxes! 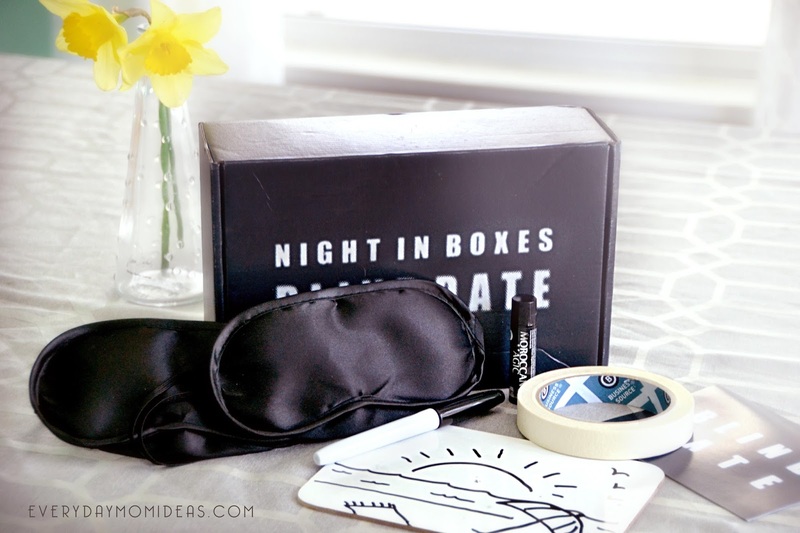 They have a Date Night In box monthly subscription that delivers a full date night right to your door. How cool is that?! Each Date Night In A Box is unique and comes with everything you need for a great memorable date night at home. No baby sitter needed! As a married couple for 15 years and with four kiddos, getting out and planning a creative memorable date is hard and it almost never happens. When we do go out it's usually to dinner and a movie. These dates are so insanely creative and super easy to put on. Just open the box and you are ready to go. 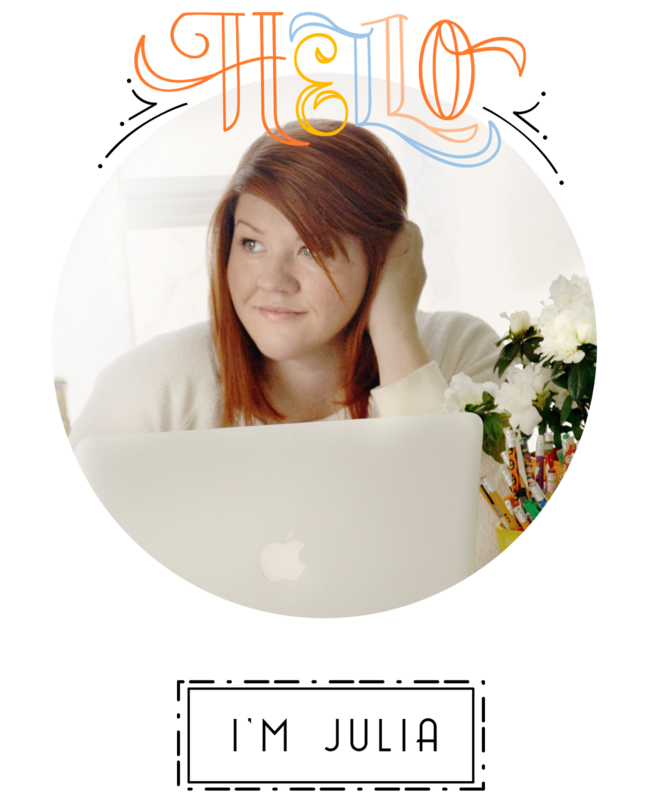 Or you can put a little extra time into with their ready-made menu, grocery list, invitation, and even an awesome coordinating playlist. 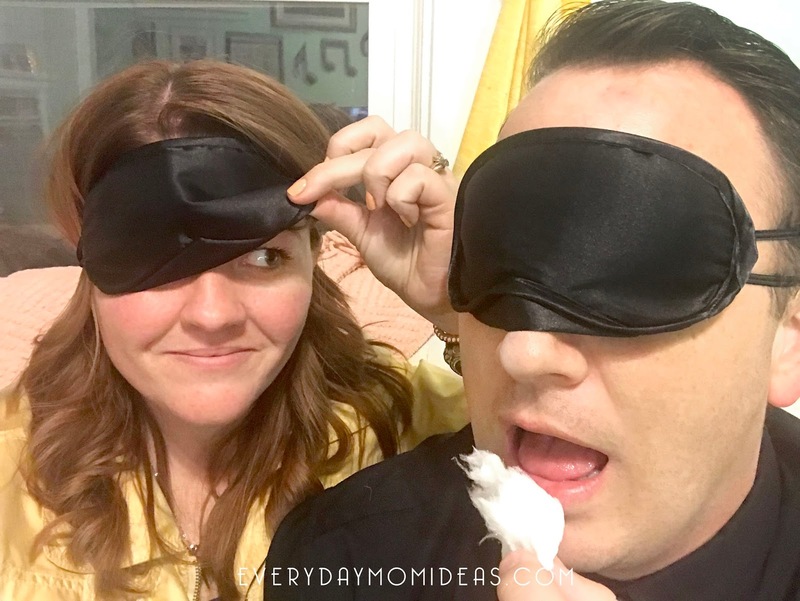 This month they did a "Blind Date" theme and it was beyond our expectations. How many married people get to blind date their spouse? I love how creative each of these date nights are. I don't know how they come up with all the different date night boxes but these people sure know what they are doing! To give you an example of the quality and care that is put into each of these dates, this Blind Date box in particular came with a link to an audio guide to help facilitate the date. Just download, push play and follow along. 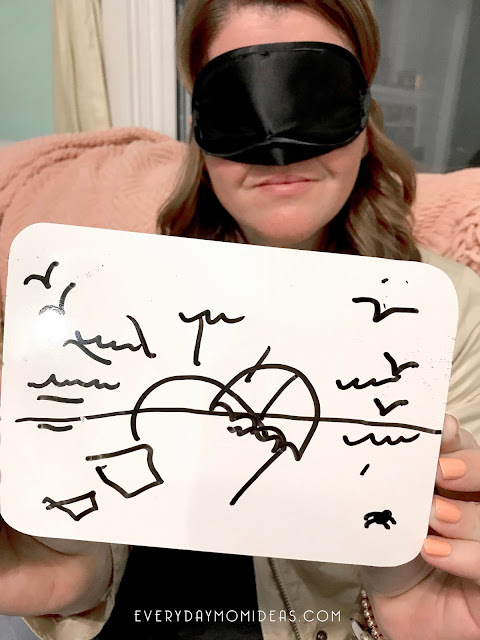 I love that they did this because for a lot of the date we were wearing our fun eye masks, so we could easily just follow along without interrupting the flow of the date. The dates are also geared towards thoughtfully connecting with each other and not just having a few fun activities to remember. Another thing I love is that each box comes with a treat. This one came with cotton candy and was actually used for part of the date, so we had to wait to eat it. It was worth the wait. This has to be the best cotton candy we have ever had. This cotton candy was made with 100% pure organic sugar and with all natural flavors. They don't just put any old crap treat in there. You get spoiled. I love knowing our date night is always in good hands with Night In Boxes. 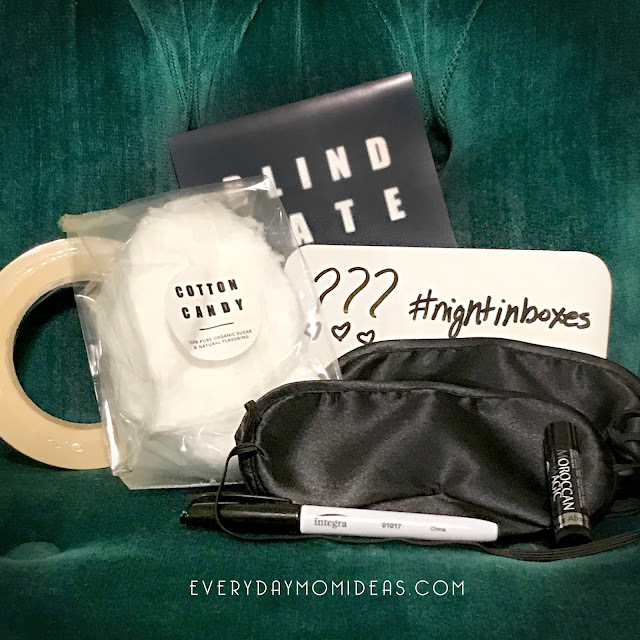 Night In Boxes is generously giving TWO of you EMI readers a free Date Night In Box! It's easy to enter to win A Date Night just fill out the rafflecopter form below. You do not have to do all the the entries. There is just one mandatory commenting entry. The winner will be announced and contacted. The prize will be directly shipped to the winners mailing address of choice. 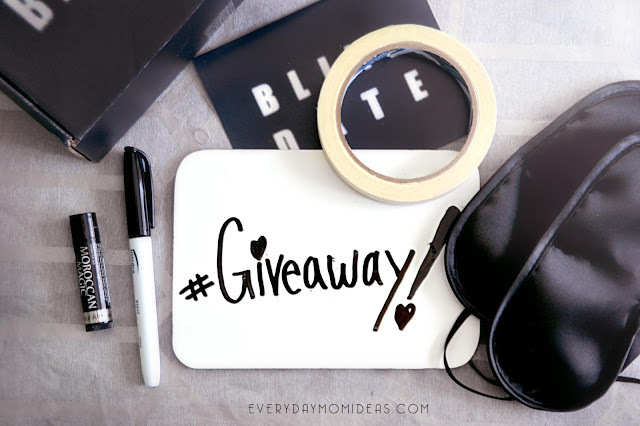 Giveaway ends April 17th, 2018. My best idea for a stay at home date night was a special seafood dinner and a good movie with the fireplace going. Best date has been just walking around downtown & getting ice cream, simple, but amazing time. 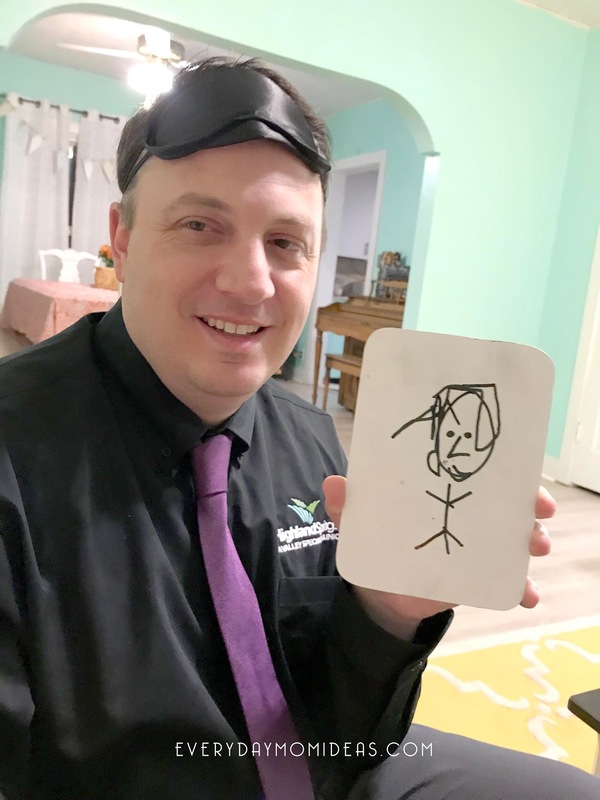 My husband made a scavenger hunt for our city. We drove around and had to find places and take pictures of the sites. So much fun and great memories. I’ve seen these boxes for a while now and have been wanting to try them out! Looks so fun! My favorite date night was on my husband and my first anniversary. We both had to work, but he got off before I did. When I came home, there was a candlelit dinner waiting for me. It was so sweet, and completely unexpected. The best date night was a night at home while the kids were away. It’s not what you do but who you are doing it with. My favourite date night we parked the van on the beach and camped out. It was pretty cool, we roasted marshmellows on the beach, had a couple beers (not allowed, but...) and talked for hours. It was a great date. Oh gosh, I love ALL of our date nights, at home or going out, big or small. Some of our favorites have to do with going places where we get to interact with, feed or pet any kind of animals, because we both crazy love all animals. We also like to laugh a lot and do big or small things on our bucket lists together. My favorite date night I've ever had was going to the the local symphony orchestra, dinner and out for drinks afterwards. My favorite date night was when we went to a Cirque Du Soleil show. Pizza, wine, and a movie are the best. My favorite date was playing jenga, eating sandwiches, and snuggling. Favorite would have to be when we go down to the lake just us and sit on the rocks like we used to when we first started dating. We haven't had a date night in a while. I enjoy when we go out to eat and spend some time away from the kids. Since I am home all the time, it's just nice to get a break. Looks like a total blast! My favorite date night was a moonlit picnic under the stars. we usually do the same hings over and over. Food, drinks, and a movie. Weve gone to a few amusement parks. It's fun to watch each others expressions as we face the rides nd food. This looks like fun. My favorite date night was when we went to the beach. We ate at a beachfront seafood restaurant and then walked on the beach. My best date was sitting on a rocky beach to watch fireworks with a campfire and a new boyfriend. Thanks so much for the chances to win! My best date was on the beach! It was just a nice long, peaceful walk. My husband & I, had this talk yesterday. In which we both agree that we need to create date nights;something simple like drinking tea out the front porch or playing monopoly. I think this is a wonderful idea! Our favorite date was our 1st date, I picked him up from LAX and straight to Disneyland we went. Now we are married with a beautiful daughter & 2 dogs! My husband and I, just had this conversation last night. We both agree that we need to start having date nights. Something simple as drinking tea while watching the sunset. Our favorite date was our 1st date. I picked him up from LAX and straight Disneyland we went. Now we are married with a daughter & 2 dogs. one night we drove to st augustine from gainesville and went to dinner and then stayed in a hotel on the beach, it was awesome. My favorite date was a bonfire and dinner all planned by my husband on my favorite spot on our farm. When we go to the country fair in August! It's like we get to be kids again. Going to dinner and a movie. I loved going to play and nice dinner in NYC. Mine was on Valentines Day when our oldest daughter was a year old. My husband and I went to an early movie and did a little shopping while my inlaws babysat. My favorite date nights are always simple- bicycle ride and picnic is my favorite! My favorite date night is just simply dinner and a movie! With four kiddos, this is about as good as it gets until they get a little older! best date night was when we went to an aimee mann concert at the zoo, it was amazing! Going for a small walk in woods and having a picnic by a brook was so beautiful. Dinner and a movie. Which means, a movie with a gigantic bucket of buttered popcorn. My favorite date night I staying home, ordering take-out dinner and watching a movie. My favorite date night was dinner and a walk around the Zoo at night under string lights. My favorite date night was the first date with my husband. It was just dinner and a movie, but we really connected. We spent so much time talking. It was wonderful. My fave is cooking up a yummy dinner, served up with a nice glass of wine. My favorite date night was when we went on an impromptu date to the beach for the day. It was so much fun. My hubby and I spent the night relaxing in front of the big screen while snuggling on the couch! My favorite date night is when my boyfriend and I went to a concert in downtown Chicago, we even splurged and took a limo! When my hubby surprised me to a trip to Panama. It was a surprise trip/date vacation for our anniversary. My favorite date night involves great food, cozy surroundings and of course great company ( my hubby is my best friend)! We do love a cuddles and a movie nights. My favorite date night involves great food, a cozy atmosphere, and great company ( my hubby is my best friend!) and we love cuddles and a movie nights! Going to eat at a restaurant I had been wanting to go to for a while.